Bet365 online casino | Are Aussie players accepted? 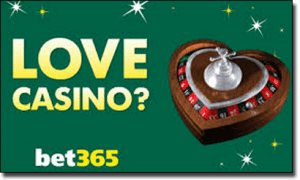 Can Australians play at Bet365 casino? Sadly at this point in time, Aussies are not able to play at Bet365.com online casino. Their table games, online slots, bingo, poker and live dealer casino titles are all unavailable to Australian punters. Why? This is due to to the intricacies of Bet365’s Australian sports book licence, which is held in the Northern Territory. What’s worse than Aussies not being able to play at the Bet365 Casino? The fact that our wayward brothers across the ditch, New Zealand, can. It’s just a slap in the face to know the Kiwi’s are enjoying all Bet365 has to offer while we sit over here in this Great Brown Land of ours, twiddling our thumbs, waiting for the legislators to click to the 21st century. Hopefully some time in the future, the Australian government’s legislative stance will soften and Aussie punters will be able to take advantage of the Bet365 Casino. In anticipation of that day, let’s have a look at what is so special about Bet365 Casino. Eligible players are truly in for a treat when we’re finally allowed to play at the Bet365 online casino for real money, because it is a great spot for a jack-of-all-trades punter. Along with Bet365’s sportsbook, bingo rooms and poker rooms, the casino aspect will truly make Bet365 a one-stop shop for all your punting needs. Bet365 is currently licensed in Gibraltar, and their casino is predominantly powered by Playtech games, a highly rated online casino software developer. They also have a contract to offer Australia’s favourite pokie manufacturer, Aristocrat. On top of that there are also Microgaming, Net Entertainment, NextGen, Play ‘n’ Go and Quickspin games on the site, just to name a few. As well as table games, Bet365 Casino also offers several bingo and keno games. If the precedent set by Bet365 Casino in other countries is anything to go by, Aussie players can come to expect a sign up bonus of 100% matched deposit up to $100. If you specify you are a slots-only player, you can claim a 200% matched deposit bonus up to $100. Hopefully the Australian government will get around to passing legislation that allows all Aussies to marvel in the punting splendour that is Bet365: their sportsbook, bingo, poker and online casino. Until that day we will have to make do with their great range of sports and offers available through their sportsbook site, Bet365.com.au. For an online casino that does accept players from Australia, we recommend Mucho Vegas, which offers hundreds of real money casino games in a vibrant, secure space with no downloads needed.